I’m a very lucky girl. You know why? Because I’ve had some absolutely amazing clients in my life. (Don’t get me wrong – I’ve had the other kind, too. I just try not to focus on those.) I’ve just had the most life-affirming September/October I can remember. I had not just one, but three fantastically amazing clients who were all surprisingly ok with the fact that they were all happening at once. One of these clients was Leah, who shall hereafter be known as the Calmest Bride Ever(tm). Seriously, brides are the reason I try to stay away from bridal work. ;) But I somehow got one who was sure she wanted me to do her dress, was able to articulate what she wanted perfectly, and then said, “You’re a pro; I completely trust you to do whatever you think is best.” Wow. Like I said: I’m a very lucky girl. The skirt overlay is some sort of mysterious illegitimate child of a chiffon and an organza. I mean, it claimed to be a chiffon, but the hand told a different story. The overlay pieces match the skirt pattern at the top, but angle out more towards the bottom so that the hem on the overlay will be wider than the hem on the dress. This is a great way to prevent the overlay from simply clinging to the dress, and it gives the finished dress more movement and grace. The dress from the front. Leah made the chain belt herself. The body-seams roughly follow those of Fouquet’s Madonna, with the obvious exception that this dress is back-lacing rather than front. The neckline, hand-points, and overskirt are all trimmed with silver lace. Speaking of lace… In an act of awe-inspiring trust, Leah handed me her mother’s vintage 60’s lace mini wedding dress with instructions to cut it up for the over sleeves and the trim at the arms and hip. I’ll be totally honest here (because I’ve already told her this) – mom and I smiled and said, “Oh, that’ll be lovely!” Later we looked at each other and said, “You know, I just don’t see that working.” We weren’t entirely sure about the silver lace, either, since the whole gown is a shade towards cream and time had turned the lace dress into a lovely warm ecru. There are times when you do something because you understand the reason why they client wants it done, even if you’re not a hundred percent sure that the aesthetics are going to work out. In this case, incorporating her mother’s gown was important because it was a way of having her mother present at the ceremony. I get that. If I ever do get married, I’d like to find a way to have my dad’s presence there. 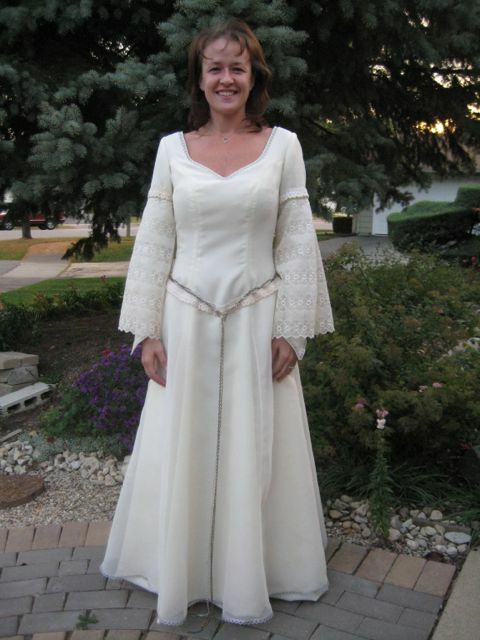 Also, there was just enough of the lace fabric to make the sleeves once. No backup plan. Right. No pressure at all. And I really, really like for people to be happy with my work. But she trusted me, so I trusted her. You know what? It worked BRILLIANTLY. I trimmed out the over sleeve hem so that it followed the lace motif. 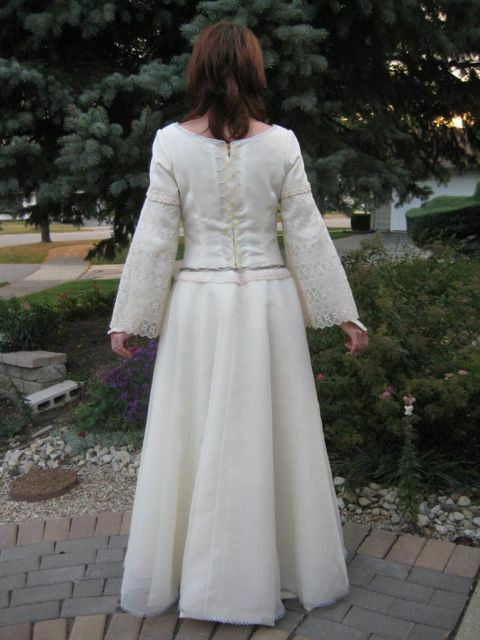 The dress from the back - I wanted a closure that looked like lacing, but I didn't want eyelets going through the dress. Also, more of the overskirt fullness is concentrated at the back. It walks rather nicely. The lacing actually goes through little loops pulled through the crepe/organza layer of the dress. 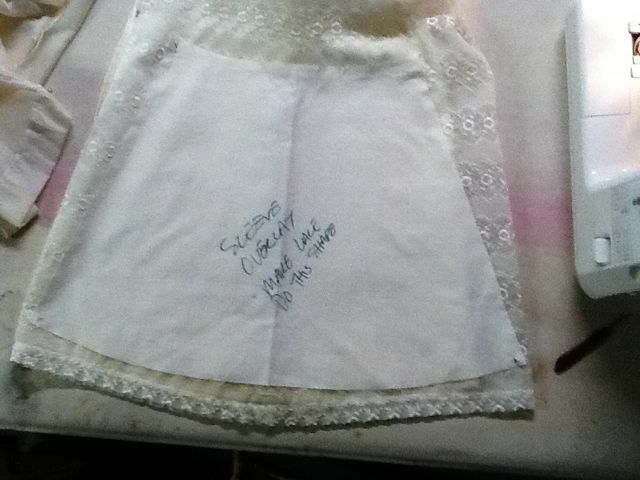 Inside the dress, a piece of covered boning is attached to the lining. 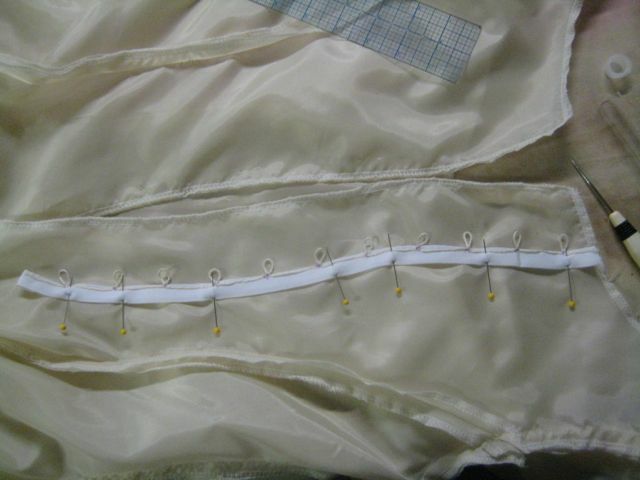 Regularly spaced loops are sewn into the casing with the boning. These loops are ultimately pulled through the outer layer of the dress. Except… I had planned to use my silly little clover embroidery tool to pull the loops through. I broke it on the second loop. Apparently, those aren’t designed with the idea of a crepe and its weird little threadies. So that left me working with an awl and a very small crochet hook, which takes longer and is, quite unfortunately, why the bride walked in to see her dress lying face-down on the work table with a spiky metal thing sticking out the back. She didn’t panic. She didn’t even bat an eye. Like I said: I am soooooo lucky. But all the little loops got fished up to the right side of the fabric, the dress went on and fit perfectly, and we decided to leave the lacing in place with enough extra ribbon to handle about anything. And I got to see the happiest bride in the world. If you’ve never been part of that moment where a woman looks at herself in the mirror and says, “Oh my god, I’m gonna be a bride! This is real!”… I can’t explain, but it’s amazing. It’s magic. It’s so deeply, profoundly satisfying on an artistic and human level to be part of that. At the ceremony last night, she told everyone that I made the dress and that it was the most beautiful wedding dress she’s ever seen and she’s so happy she gets to wear it, and she gave me a big hug. I might have teared up a little. But only just a bit. Which mostly means that I teared up a lot more when I got home. That was one of the proudest moments of my life. She didn’t have to say anything at all. But she did. Previous How close to the edge of my bias should I sew? is one of the reasons I adore reading your posts. That and the absolutely amazing instructions and how-to’s of course! Lovely. You SHOULD be proud of yourself. Thanks for the info on lacing loops – I used it to do something similar to a dress I made. Worked like a charm!